We have had such a busy summer this year running courses and building the house it feels as if I had slightly forgotten to market our craft retreat..meaning we have a couple of spaces still to fill! It is a wonderful week, full of everything which helps me to feel good and relax- being outdoors, gentle exercise and being creative…in a beautiful part of Scotland. Join us for optional morning yoga with Joanie, a long leisurely breakfast and then either a day of craft or exploring beautiful Highland places. 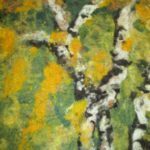 You can take part in a natural dyeing workshop, felting and eco-printing. Create a stunning felted wall-hanging, bag, scarf or other item -and go home with a silk scarf you have printed using flowers and leaves. Dye fleece outdoors in the woods, foraging for dye plants creating stunning natural colours. 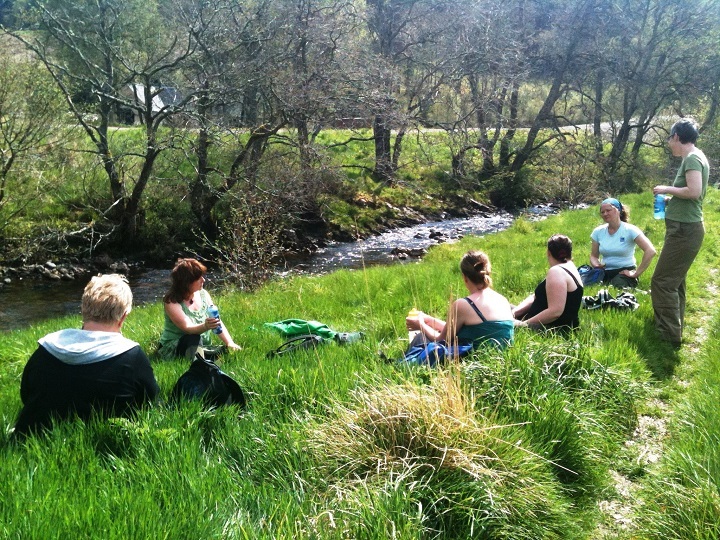 Enjoy days out walking in Glen Affric, Plodda waterfalls and loch Ness. These are gentle rambles, not route marches! If you are interested in learning to spin, we can also add two days of spinning tuition with Alison, replacing other crafts. Stay at the Old Stables which is a beautifully converted old barn with all the modern luxuries, underfloor heating and plenty of space for yoga and relaxation. You can join in with as much or as little as you fancy, when you stay with us. We provide all the meals, cooked using our own or as much local produce as possible. We pick all our guests up from Inverness which can be easily reached by plane, train or bus. Overseas travellers can easily reach Inverness, either directly from Amsterdam, or from London, Edinburgh and Glasgow. If you are interested in joining us, please contact us to find out more..